At some airports, underground fuel pipes allow refueling without the need for tank trucks. Trucks carry the necessary hoses and pressure apparatus, but no fuel. Most current commercial airlines and military aircraft use jet fuel for maximum fuel efficiency and lowest cost. These aircraft account for the vast majority of aviation fuel refined today, which is also used in diesel aircraft engines. Other aviation fuels available for aircraft are kinds of petroleum spirit used in engines with spark plugs (e.g., piston and Wankel rotary engines). Specific energy is the important criterion in selecting an appropriate fuel to power an aircraft. Much of the weight of an aircraft goes into fuel storage to provide the range, and more weight means more fuel consumption. Aircraft have a high peak power and thus fuel demand during take-off and landing. This has so far prevented electric aircraft using electric batteries as the main propulsion energy store becoming widely commercially viable. Ground fueling of a MIG-29 from a URAL tanker (2011). Jet fuel is a clear to straw-colored fuel, based on either an unleaded kerosene (Jet A-1), or a naphtha-kerosene blend (Jet B). Similar to diesel fuel, it can be used in either compression ignition engines or turbine engines. Jet-A powers modern commercial airliners and is a mix of pure kerosene and burns at temperatures at or above 49 °C (120 °F). Kerosene-based fuel has a much higher flash point than gasoline-based fuel, meaning that it requires significantly higher temperature to ignite. It is a high-quality fuel; if it fails the purity and other quality tests for use on jet aircraft, it is sold to other ground-based users with less demanding requirements, such as railroad engines. Avgas (aviation gasoline) is used in spark-ignited internal-combustion engines in aircraft. Its formulation is distinct from mogas (motor gasoline, a/k/a petrol) used in cars and many military vehicles, such as the "Deuce and a Half". Formulated for stability, safety, and predictable performance under a wide range of environments, avgas is typically used in aircraft which use reciprocating or Wankel engines. Fuels such as sustainable aviation fuel have the advantage that few or no modifications are necessary on the aircraft itself, provided that the fuel characteristics meet specifications for lubricity and density as well as adequately swelling elastomer seals in current aircraft fuel systems. Sustainable aviation fuel and blends of fossil and sustainably-sourced alternative fuels yield lower emissions of particles and GHGs. They are, however, not being used heavily, because they still face political, technological, and economic barriers, such as currently being more expensive than conventionally produced aviation fuels by a wide margin. Compressed natural gas (CNG) and liquified natural gas (LNG) are fuel feedstocks that aircraft could switch to, other than conventional fossil-oil. Turbofans for instance can be operated on a number of different fuels, and some have been made optimized for use with natural gas. Some aircraft, such as the Tupolev Tu-155, as well as the "SUGAR Freeze" aircraft under NASA's N+4 Advanced Concept Development program (made by Boeing's Subsonic Ultra Green Aircraft Research (SUGAR) team), were designed to run on LNG. The low specific energy of natural gas even in liquid form compared to conventional fuels gives it a distinct disadvantage for flight applications. The production of aviation fuel falls into two categories: fuel suitable for turbine engines and fuel suitable for internal combustion engines. There are international specifications for each. Jet fuel is used in both turboprop and jet aircraft, and must maintain a low viscosity at low temperature, meet definite limits in terms of density and calorific value, burn cleanly, and remain chemically stable when heated to high temperature. Aviation gasoline, often referred to as "avgas" or 100-LL (low-lead), is a highly refined form of gasoline for aircraft, with an emphasis on purity, anti-knock characteristics and minimization of spark plug fouling. Avgas must meet performance guidelines for both the rich mixture condition required for take-off power settings and the leaner mixtures used during cruise to reduce fuel consumption. Avgas is sold in much lower volume than jet fuel, but to many more individual aircraft operators; whereas jet fuel is sold in high volume to large aircraft operators, such as airlines and military. BP Avgas 80, 44.65 MJ/kg, density at 15 °C is 690 kg/m3. Kerosene type BP Jet A-1, 43.15 MJ/kg, density at 15 °C is 804 kg/m3. Kerosene type BP Jet TS-1 (for lower temperatures), 43.2 MJ/kg, density at 15 °C is 787 kg/m3. In performance calculations, airliner manufacturers use a density of jet fuel around 6.7 lb/USgal or 0.8 kg/l. Bombardier Aerospace: The Challenger Multi-role Aircraft is a special mission variant of the Bombardier Challenger 650 business jet platform. Bombardier bases performance on the use of fuel with an average lower heating value of 18,550 BTU/lb (43.147 MJ/kg) and a density of 0.809 kg/l (6.75 lb/US gal). Embraer: In its airport planning manual for the E195 uses an adopted fuel density of 0.811 kg/l (6.77 lb/US gal). Aviation fuels consist of blends of over two thousand chemicals, primarily hydrocarbons (paraffins, olefins, naphthenes, and aromatics), additives such as antioxidants and metal deactivators, biocides, static reducers, icing inhibitors, corrosion inhibitors, and impurities. Principal components include n-heptane and isooctane. Like other fuels, aviation fuel for spark-ignited piston engines are described by their octane rating. Alcohol, alcohol mixtures, and other alternative fuels may be used experimentally, but alcohol is not permitted in any certified aviation fuel specification. In Brazil, the Embraer Ipanema EMB-202A is a version of the Ipanema agricultural aircraft with a modified Lycoming IO-540-K1J5 engine so as to be able to run on ethanol. Other aircraft engines that were modified to run on 100% ethanol were several other types of Lycoming engines (including the Lycoming 235N2C, and Lycoming IO-320) and certain Rotax engines. The Convention on International Civil Aviation (ICAO) (Chicago 1944, Article 24) exempts air fuels already loaded onto an aircraft on landing (and which remain on the aircraft) from import taxes. Bi-lateral air services agreements govern the tax exemption of aviation fuels. In the course of an EU initiative, many of these agreements have been modified to allow taxation. Also, the motion for a European parliament resolution on a European Strategy for Low-emission Mobility has stated that "the possibilities for harmonised international measures for kerosene taxation for aviation" needs to be explored. Australia and the United States oppose a worldwide levy on aviation fuel, but a number of other countries have expressed interest. During a debate in the UK Parliament, the forgone tax income due to the exemption of tax on aviation fuel was estimated at £10 billion annually. Furthermore, the planned inclusion of international aviation into the European Union Emission Trading Scheme in 2014 has been called an 'illegal tax' by countries including the US and China, which cite the Chicago Convention. Fuels have to conform to a specification in order to be approved for use in type certificated aircraft. The American Society for Testing and Materials (ASTM) developed specifications for automobile gasoline as well as aviation gasoline. These specifications are ASTM D910 and ASTM D6227 for aviation gasoline and ASTM D439 or ASTM D4814 (latest revision) for automobile gasoline. 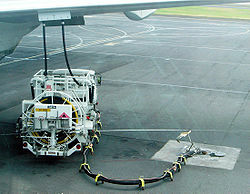 Aviation fuel generally arrives at the airport via pipeline systems, such as the CEPS. It is then pumped over and dispensed from a tanker or bowser. The fuel is then driven up to parked aircraft and helicopters. Some airports have pumps similar to filling stations to which aircraft must taxi. Some airports have permanent piping to parking areas for large aircraft. Aviation fuel is transferred to an aircraft via one of two methods: overwing or underwing. Overwing fueling is used on smaller planes, helicopters, and all piston-engine aircraft. Overwing fueling is similar to car fueling — one or more fuel ports are opened and fuel is pumped in with a conventional pump. 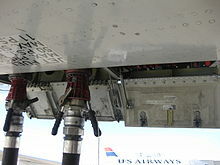 Underwing fueling, also called single-point refueling or pressure refueling where not dependent on gravity, is used on larger aircraft and for jet fuel exclusively. For pressure refueling, a high-pressure hose is attached and fuel is pumped in at 275 kilopascals (40 psi) and a maximum of 310 kilopascals (45 psi) for most commercial aircraft. Pressure for military aircraft, especially fighters, ranges up to 415 kilopascals (60 psi). Air being displaced in the tanks is usually vented overboard through a single vent on the aircraft. Because there is only one attachment point, fuel distribution between tanks is either automated or it is controlled from a control panel at the fueling point or in the cockpit. An early use of pressure refueling was on the de Havilland Comet and Sud Aviation Caravelle. Larger aircraft allow for two or more attachment points; however, this is still referred to as single-point refueling, as either attachment point can refuel all of the tanks. Multiple attachments allow for faster fuel flows. Because of the danger of confusing the fuel types, precautions are taken to distinguish between avgas and jet fuel beyond clearly marking all containers, vehicles, and piping. The aperture on fuel tanks of aircraft requiring avgas cannot be greater than 60 millimetres in diameter. Avgas is often dyed and is dispensed from nozzles with a diameter of 40 mm (49 mm in the United States). Jet fuel is clear to straw-colored, and is dispensed from a special nozzle called a J spout or duckbill that has a rectangular opening larger than 60 mm diagonally, so as not to fit into avgas ports. However, some jet and turbine aircraft, such as some models of the Astar helicopter, have a fueling port too small for the J spout, and thus require a smaller nozzle. Any fueling operation can be very dangerous, and aviation operations have characteristics which must be accommodated. As an aircraft flies through the air, it can accumulate static electricity. If this is not dissipated before fueling, an electric arc could occur and ignite fuel vapors. To prevent this, aircraft are electrically bonded to the fueling apparatus before fueling begins, and are not disconnected until after fueling is complete. Some regions require the aircraft and/or fuel truck to be grounded too. Pressure fueling systems incorporate a dead man's switch to preclude unmonitored operation. Aviation fuel can cause severe environmental damage; all fueling vehicles must carry equipment to control fuel spills. Fire extinguishers must be present at any fueling operation. Airport firefighting forces are specially trained and equipped to handle aviation fuel fires and spills. Aviation fuel must be checked daily and before every flight for contaminants such as water or dirt. Many airlines now require safety belts be left unfastened should passengers be aboard during refueling. ^ "Aviation Fuel". Archived from the original on 23 June 2012. Retrieved 10 May 2012. ^ U.S. Centennial of Flight Commission. "Aviation Fuel". Archived from the original on 20 April 2012. Retrieved 10 May 2012. ^ Wang, M.; Chen, M.; Fang, Y.; Tan, T. (2018). "Highly efficient conversion of plant oil to bio-aviation fuel and valuable chemicals by combination of enzymatic transesterification, olefin cross-metathesis, and hydrotreating". Biotechnology for Biofuels. 11: 30. doi:10.1186/s13068-018-1020-4. PMC 5801801. PMID 29445419. ^ Corporan, Edwin; et al. (2011). "Chemical, Thermal Stability, Seal Swell, and Emissions Studies of Alternative Jet Fuels". Energy & Fuels. 25 (3): 955–966. doi:10.1021/ef101520v. ^ "RREB report" (PDF). kic-innoenergy.com. Archived (PDF) from the original on 14 September 2016. Retrieved 7 May 2018. ^ "Bringing biojet fuels to the market". Archived from the original on 2016-11-05. Retrieved 2016-12-27. ^ "Aircraft Design - MIT Laboratory for Aviation and the Environment". Archived from the original on 2016-12-30. Retrieved 27 December 2016. ^ EnergyWire. "Could natural gas fuel commercial flights of the future?". Archived from the original on 2016-11-05. Retrieved 2016-12-27. ^ Air BP. "Avgas vs Jet Fuel". Archived from the original on 25 April 2012. Retrieved 10 May 2012. ^ Sergeant Oil & Gas Co Inc. "Aviation gasoline". Archived from the original on 28 May 2012. Retrieved 10 May 2012. ^ FAA. "FAA Ethanol Safety Document". Archived from the original on 12 January 2012. Retrieved 10 May 2012. ^ "The Team - Vanguard Squadron". Archived from the original on 16 October 2016. Retrieved 27 December 2016. ^ "Lycoming engines for ethanol use" (PDF). caddet-re.org. Archived (PDF) from the original on 17 May 2017. Retrieved 7 May 2018. ^ House of Commons Library. "Taxing aviation fuel. Standard Note SN00523 (2012)" (PDF). p. 3, note 11. Retrieved 4 Nov 2016. ^ "REPORT on a European Strategy for Low-Emission Mobility - A8-0356/2017". www.europarl.europa.eu. Archived from the original on 6 December 2017. Retrieved 7 May 2018. ^ Lucas, Caroline. "Does the government subsidise airlines by £10 billion?". 2012. Factcheck. Archived from the original on 17 August 2013. Retrieved 27 August 2013. ^ Malina, Robert (2012). "The Impact of the European Union Emissions Trading Scheme on US Aviation". Journal of Air Transport Management. 19: 36–41. doi:10.1016/j.jairtraman.2011.12.004. Archived from the original on 15 February 2015. Retrieved 27 August 2013. ^ "REFUELLING THE COMET". Archived from the original on 17 May 2013. Retrieved 2 July 2013. ^ CSGNetwork.com. "Aviation Fuel-AvGas Information Aviation Gasoline". Archived from the original on 25 May 2012. Retrieved 10 May 2012. ^ Shell.com. "AvGas Grades and Specifications". Archived from the original on 28 May 2012. Retrieved 10 May 2012. ^ "Rules and Regulations" (PDF). Archived from the original (PDF) on 2011-01-05. Retrieved 2010-04-22. "Shauck and his wife flew a single-engine airplane across the Atlantic Ocean in 1989 using 100% ethanol". December 2005. Archived from the original on 2006-09-27.